Walk over the thick sheet of ice over the frozen Zanskar River as it twists and turns across Ladakhi mountains for a riveting 9-day Chadar trek. This adventure promises to showcase the gorgeous and arid landscape of Zanskar, with frozen waterfalls, barren mountain cliffs, ancient caves and rugged canyons. You'll spend days trekking over the thick layer of ice, blanketing the Zanskar River, and camp at night besides the river's turquoise waters. A truly once-in-a-lifetime experience, the Chadar trek ranks as one of the most celebrated treks in the India. A breathtaking adventure at over 11,000 feet in Ladakh, the Chadar trek requires travellers to spend hours walking over the frozen river in sub-zero temperatures. | If you are not cleared in the medical test in Leh, you will not be allowed to join the trek. There are NO refunds in this case, and the operator will not be liable to make alternate arrangements for your time in Leh. During the winters, when the roads of Ladakh are snowed in, the only way of getting around is by walking over the frozen Zanskar River. With temperatures dropping below zero, the cobalt blue waters of the river begin freezing, eventually forming a thick blanket, or 'Chadar', over the Zanskar River. The Chadar trek follows the serpentine route of the frozen Zanskar River, allowing trekkers to get an entirely different perspective of the Ladakhi mountains. • Complete the Chadar trek, one of the most famous treks of India. • Trek to the frozen waterfall at Nyerak Pulu. 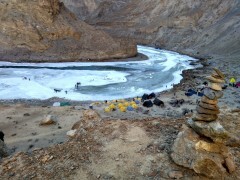 • Trek and camp over the thick, frozen ice on the Zanskar River. • Get breathtaking views of the Zanskar mountain ranges. Travellers are required to follow instructions of the trek leader during the Chadar trek. Travellers are requested to treat the local culture with respect and avoid littering, defacing property and monuments and causing general disturbance. | If you are not cleared in the medical test in Leh, you will not be allowed to join the trek. There are NO refunds in this case, and the operator will not be liable to make alternate arrangements for your time in Leh. For cancellations made more than 30 days before departure of the Chadar trek: 75% refund. For cancellations made 20-30 days before departure of the Chadar trek: 50% refund. For cancellations made less than 20 days before departure of the Chadar trek: no refund. All refunds will be processed after deducting INR 200 person. This fee is charged by The Great Next. Temperatures in Leh during the winter season tend to drop below zero. In this package, travellers will stay in hotel rooms with heaters. A separate package where travellers will stay in a hotel with centralized heating can be arranged at an additional cost of INR 5,000 per person. The tour operator reserves the right to cancel or alter the itinerary of the trek to ensure maximum safety for travellers as well as staff.| If you are not allowed to join the trek, the operator is not responsible for any activities, illness, injury, or additional expenses during your stay in Leh. Arrive in Leh today and report at a pre-arranged hotel in the city. You can spend the rest of the day at leisure. You can visit the Leh marketplace for any last minute shopping, but try not to exert yourself too much since your body will need some time to acclimatize to the city's high altitude. Overnight in a hotel at Leh. The day is reserved for you to acclimatize to the city's high altitude. Depending on weather conditions, you may embark on a short walk through the city to aid the acclimatization process. You'll also visit a local hospital in Leh for a medical check-up. This is a short and basic check, primarily intended to ensure proper acclimatization. You can spend the rest of the day at leisure. Overnight in a hotel at Leh. Wake up early for the first day of your Chadar experience. You'll begin with by travelling to the road head at Tilat Do in a private, shared vehicle. A scenic drive past the gorgeous and arid landscapes of Leh, you'll get your first views of the frozen Zanskar during the drive. From Tilat Do, you'll begin trekking towards Shingra Koma. 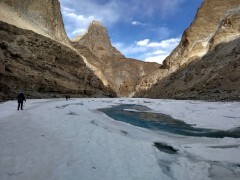 Over a short trek of 2 hours, you'll learn how to slide and walk over the unusual terrain of the frozen Zanskar River. Overnight in tents at Shingra Koma. After your first night of camping over the ice, you'll begin trekking towards the day's destination of Tibb Cave. Make you way across the slippery ice, with a few tricky sections, to views of the Zanskar gorge. In some areas of the river, you'll be trekking alongside the waters of the Zanskar with blocks of ice floating and flowing with the water. Overnight in tents at Tibb Cave. Proceed deeper into the icy realms of the Zanskar gorge. 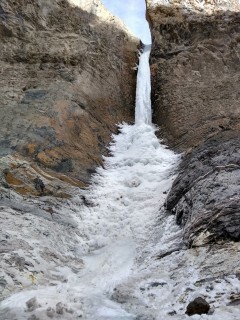 An 8-hr trek across the Chadar, today's destination of Nyerak Pulu is located just past the famous frozen waterfall. Riveting views of the barren and rugged mountain cliffs on either side of the river will continue to accompany you. Overnight in tents at Nyerak Pulu. Begin the return trek by retracing your steps to Tibb Cave. Even though you've trekked over this route yesterday, you'll get a slightly different experience of the Chadar since the frozen ice often breaks, melts and reforms over night, leading to changes in the terrain. Tibb Cave, your destination for the day, is a series of ancient caves that today provide refuge to travellers over the frozen Zanskar. Local villagers wearing traditional woollen robes are often seen hauling goods and traversing the route to Tibb Cave. Overnight in tents at Tibb Cave. Make you way to Bakula, a windy and abandoned campsite located at a higher altitude than the river. En route, you'll trek past the Shingra Koma campsite. The walk to Bakula is peppered with views of frozen waterfalls, towering mountains and icy landscapes. The Bakula campsite gets more sunlight than all the other campsites during the trek, since the mountain walls don't block the sun in the morning. Overnight in tents at Bakula. Conclude the Chadar trek by returning to Tilat Do. Here, vehicles will be waiting to take you back to the comfortable hotel rooms of Leh. You can spend the rest of the day at leisure. Stay, relax and celebrate the end of the Chadar trek in the hotel or visit the local marketplace to shop for souvenirs and gifts. Overnight in a hotel at Leh. Check-out of the hotel by 10:00 hrs. Your trip ends here. Arrive in Leh and travel to a pre-arranged hotel in the city. The exact address of the hotel will be communicated to you after confirmation of the booking. Transport between the airport and the hotel is not included in the package, but you may hire private cabs/taxi from the airport. You'll be accommodated at a hotel in Leh on twin-sharing basis. Since no meals are included in today's meal package, you can visit any of the restaurants in Leh to have meals at your own expense. Clear a basic medical check-up conducted at the Sonam Norboo Memorial Hospital in Leh. You'll be accommodated at the same hotel as yesterday. The hotel rooms include a heater, to ward off the winter chill of Leh. Since no meals are included in today's meal package, you can visit any of the restaurants in Leh to have meals at your own expense. Overnight in tents at Shingra Koma. Travel from Leh to Tilat Do in shared, private vehicles, most probably a Bolero, Sumo, Jeep or similar vehicle. Trek from Tilat Do to Shingra Koma. You'll be accommodated in tents on twin-sharing basis. Your dome tents will be equipped with sleeping bags and mattresses. The campsite is also equipped with common kitchen/dining tent and washroom tent. Today's meal package includes lunch and dinner only. You may want to have breakfast at your own expense at the hotel in Leh. Overnight in tents at Tibb Cave. Trek from Shingra Koma to Tibb Cave. During the initial part of the trek, you'll slip and fall multiple times while sliding over the frozen Zanskar. Most people learn the walking technique required after an hour or two of trekking. You'll be accommodated in tents on twin-sharing basis. Today's meal package includes breakfast, lunch and dinner. Overnight in tents at Nyerak Pulu. Trek from Tibb Cave to Nyerak Pulu. You'll be accommodated in tents on twin-sharing basis. Today's meal package includes breakfast, lunch and dinner. While non-vegetarian options may not be available on most days, meals will generally include egg preparations. Trek from Nyerak Pulu to Tibb Cave. You'll be accommodated in tents on twin-sharing basis. Today's meal package includes breakfast, lunch and dinner. Make sure to carry thermal wear, sweaters, warm gloves, socks and monkey caps, since temperatures often drop to sub-zero levels. Overnight in tents at Bakula. Trek from Tibb Cave to Bakula. You'll be accommodated in tents on twin-sharing basis. Today's meal package includes breakfast, lunch and dinner. Throughout the entire trek, you'll be accompanied by an experienced trek leader and a support staff of helpers, cooks and porters. Trek from Bakula to Tilat Do. Travel from Tilat Do to Tilat Do in shared, private vehicles, most probably a Bolero, Sumo, Jeep or similar vehicle. Today's meal package includes breakfast, lunch only. You can visit any of the restaurants in Leh to have additional meals at your own expense. Check-out time at the hotel is 10:00 hrs. No meals are included in today's package. Transport between the hotel and airport is not included in the package, but you may hire private cabs/taxi from the hotel. Your trip ends here. You'll be picked-up from a pre-arranged hotel in Leh, the exact co-ordinates of which will be shared after confirmation of booking. Leh is connected to most major cities of India via frequent flights to Leh's Rimpochee Airport. If you're travelling from outside India, book a connecting flight from New Delhi.